We’re back in Nicaragua for our sixth year. It’s strange we’ve been living here so long. It’s strange that Nicaragua feels so much like home. It’s strange that I get back and the men on the street who drink all day welcome me back and tell me how I’ve been away too long. It’s strange that none of this feels strange to me anymore. Readjustments: the left handle of the sink gives the same results as the right, drink water from the sinks sparingly (if at all), throw toilet paper in the trash, not the toilet. We don’t have air conditioning, and after nearly two months away, my body adjusted to cooler temperatures. I grouched at my son today, largely because I was hot and sticky and uncomfortable. Time to regain my tolerance for heat and humidity. The cliché says, “Home is where the heart is,” but I’m seeing that differently now. My initial, silent response is, “Yeah, you could.” I imagine there are folks for whom this would feel impossible–for example, folks who are so committed to their comforts that “sacrifices” like living without air conditioning sound like torture. But I also firmly believe that people can adjust pretty quickly, and God makes us capable of doing things we thought we couldn’t. He actually kind of specializes at that. I don’t debate with them, of course. I just try to convey that it isn’t really extraordinary of heroic, it’s merely different. It’s strange to them because it’s not their normal. It was strange to me, too. But now, not so much. For this weekend, right now as I’m writing this, I was invited to play in the very old people’s division of Nationals, as in, the ultimate (frisbee*) national tournament. If you’re new to this blog, I passionately (sometimes irrationally) love ultimate. I’ve never played in Nationals. This was a life goal, which at 47 I thought had passed me. Then I was invited…and couldn’t go. I’m not writing this for you to feel sorry for Okay, check that. Yeah, I’ll take the sympathy. It hurts. I couldn’t play because in the aftermath of my accident, I was found at fault (I pulled out and didn’t see him coming in time, and have no memory of it to say otherwise) and he was “suggesting” that we might need to pay $10,000 or more to fix his vehicle. By the time we got this negotiated down to something that would not derail us financially (thank God), it was too late. There were other reasons: serious logistical challenges, putting my family out, missing the first day of school, et al. It was going to strain our finances severely even if we didn’t have the other guy’s huge SUV repair bill (in addition to our own huge minivan repair bill and the repair Mike bill). This is a cost of our living in Nicaragua. It matters to me a lot more than living without air conditioning or hot water, or changing where I put the toilet paper. And yet, though I’m bummed, truly, I’m also glad to be home. Much more than I thought, I was happy to see my friends today and not fixated on what I didn’t get to do. You could (tentatively) call that maturity, and I suppose that might be true to some degree. Then again, you might know me and know better. I think that I’ve come to feel this place is really home and, after two months of living in other people’s homes, I was ready to be back. If you’ve never done what we do, it’s probably a little difficult to imagine this transition-back-and-forth part. You might liken it to going on vacation, but it really isn’t like that, for me. Some missionaries have very different cycles. Some are here for two years or three years and then back in the States for six months or a year. I wouldn’t like that, for our children. Some missionaries rarely go back at all. I’m not signing up for that, either, again especially for our kiddos and their relationships with our extended family. One of the highest costs we pay (yes ,even higher than foregoing an ultimate tournament) is having them be with their grandparents and cousins once a year, or maybe twice if they come to visit us. It isn’t a vacation because, instead of going somewhere to relax and take in the sights, it’s my one time to reconnect with some of the most important people in our lives, communicate with the people and churches that support us about how we are and how our work here is going, and make certain that our support is in place for the coming year. For some people, that’s the hardest part about this life. Being a bit of a hyper-extrovert, I enjoy that time, but it’s also exhausting and I usually come out of it feeling like I’ve failed to see enough people and to connect as deeply as I’d like. It’s a lot to keep relationships going when seeing people face-to-face once a year. There simply is never enough time. And that’s the nature of our lives, straddling two worlds. 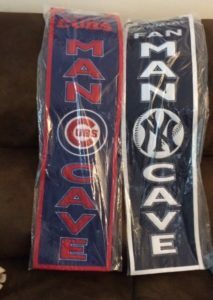 Evidence that I share “my” man cave with the local Cubs fan (who also happens to be the homeowner). The people in our lives are extraordinarily generous. It’s no small thing letting our traveling circus come crash for two weeks or a month. Exhausting and expensive and noisy and hungry–and then there’s Kim and the kids in addition. 😉 Kim’s dad and step-mom created an “apartment” over their garage expressly so our girls would have somewhere with privacy when we come stay. My elder sister and my brother-in-law built me a “mancave” in their basement for my visits. Granted, he uses it the rest of the year, but truly, they did it for my sake. In some ways, being there with them and enjoying that space is the closest I get to a true time to relax. I always gain weight when I’m in the States, no matter how hard I try to exercise. Every visit is special, we’re always feasting, and we get to eat lots of food we miss the rest of the year. Not all of it is fattening–I must have approached turning a tint of blue this year, I ate so many blueberries in Wenatchee after my in-laws discovered a u-pick organic blueberry patch for $3/lb. We eat apples and all the stone fruit we can, because that’s our chance for the year. But I’m also off my usual routine, both for what I eat and how I exercise. Seven weeks is a long time to do that. Again, though, our family we stay with truly extends themselves to stock food we like. We experience God’s love through hummus and granola, cherries and ice cream. Life goes on while we’re gone. People transition, kids grow up, that whole pursuit of the American Dream takes place. I have lots of conversations with God and myself about whether I’m missing the boat. Is this faith or foolishness? What is the difference, exactly? Then I’m preaching at a baptist church I’m and afterwar a guy I’ve never met before tells me how excited he is for the work we’re doing here and the preschool Kim’s starting in our barrio and how he feels like God is leading him, nudging him, to help out. And he writes a check for $4,000. And I remember a few things. This is God’s work he’s called us to. Maybe we are foolish, but I don’t think that’s the bottom line. The bottom line is that God loves the kids who live in this slum and wants to change the trajectory of their lives. When the average age of a girl entering prostitution in Nicaragua is nine, the years before nine are how crucial? And kids who grow up in homes without a single book, without anyone literate in the house, consider how they start school in kindergarten, recognizing no numbers or letters, never having been read to (contrasted with our kids, who owned dozens of books before they could hold, much less read, them). That’s not all we do here. We do a lot, when I add it all up. I preach and I’m an elder and sometimes counselor and I coach and teach and, primarily, I spend a lot of time mentoring young adults. Kim is a teaching coach, helped start the little school in our barrio, and now will begin a preschool, partnering with our neighbor who has preschool aged kids and herself completed only first grade. And, most importantly, we’re parenting our traveling circus. I hope you get that I’m no more bragging about this than I am whining about the challenges we face (except the ultimate tourney; definitely whining about that). I’m talking about home. We’re where we belong, doing the work we’re supposed to be doing. I teach my high school seniors that the quick and dirty definition of your calling is the point at which your passion intersects with the world’s needs. We’re far from doing this perfectly, and it’s taken me a number of years to embrace this as home (read: stop hating it). But it makes sense to me. It’s strange how normal it’s become, strange how it’s not strange anymore. I could have died in my accident (pretty sure the outcome would have been grim, had I not been wearing my seatbelt), but that didn’t make me want not to come back. Neither did the dirt “road” in front of our house, even though it’s looking particularly daunting in it’s current state (you may have done off-roading that looks tamer than this). We recently had an emergency in our church community here, and I was the first person they sought out. I wasn’t here to help. I didn’t feel guilty for being at my sister’s, spending focused time with one of our daughters, but I felt sad, not being home to care for my friend. Then again, that’s a question we can all ask. *”Frisbee” is a name brand of a plastic disc that serious ultimate players don’t use for ultimate, but the game is known as “ultimate frisbee” to people who don’t play. Just one of those cases in which the name brand has become associated with the general object, like “Kleenex” or “Xerox” or “Coke.” We use Discraft Ultrastars and some use Innova Pulsars. It truly helps to see it thru your eyes, and to better understand why and “where” you are in this adventure, and commitment. I do so admire all that you are doing, It makes me so very proud of these decisions that you have–and are making. Thank You, and your Family for all that you are doing.